We will depart from the city of Marrakesh, passing through the olive trees and the corners, and through the magnificent views of the great Atlas area. We'll then pass by Demnate, a small town of the High Atlas in the north-east of Marrakech which is known by its Jewish district (Mellah) and by its natural bridge "Iminifri", it's considered as one of the most touristic sites in this region and continue then to waterfalls of Ouzoud which are about 110m high, before going to explore another beautiful city Azilal.After it will be time to drive toward the Lovely and Happy valley of Bougmaz, full of tranquility and serenity, to spend night there. We are in the high Atlas, the valley of Aït Bouguemez, nicely nicknamed "the happy valley" for the beauty of its places and the hospitality of its inhabitants. This valley will offer you a moment of meditation and relaxation. For the fans of hiking and scouting, here is the right place. This area is also for those who love the sun and its rays as we’ll then visit the massif of Mgoun and enjoy the valleys of roses. Day3: ait bougmez_ait mhamed- bin el ouidane dam- Anergi- Imilchil ait bougmez. We'll leave imilchil to the plateau of the twin lakes called Tislit and Isli which means literally the bride and the groom, it is an Amazigh legend that surrounds the origin of lakes Isli and Tislit tinged with romance and tragedy, a sort of "Romeo & Juliet" Moroccan style. It is an opportunity to see the place that goes back to a distant time "Isli AND Tislit". During the "Imilchil Engagement Moussem", young men and women, observe each other, take part in poetic competitions in the hope to discover, seduce, and marry the loved one. Be sure that you will enjoy your stay here for real. We will leave Imilchil in direction of the village of Agoudal which is perched in the High Atlas, where roads and tracks coming from the gorges of Todra to join Dadès. You will have an amazing journey on these gorges and you will enjoy splendid passes. Agoudal is recognized as the highest village in Morocco and is at a crucial crossroads in the region. Agoudal is your ideal place for mountain trek departures, your serene resting place and also for all nature lovers, it is indeed a pleasant stopover. We pass then by the famous Todgha Gorges, it is usually frequented by hikers and climbers thanks to its big rocky walls which are up to 300 meters. We will follow our road to Tinghir, a small city in the center of one of the most beautiful oases in southern Morocco. Its lush palm grove extends for about 30km following the Wadi Todgha with the fabulous views of jebel Sahro. Then we'll reach Dades Valley and Dades Gorges that you must visit...absolutely amazing. We will spend the night in Dades Gorge. 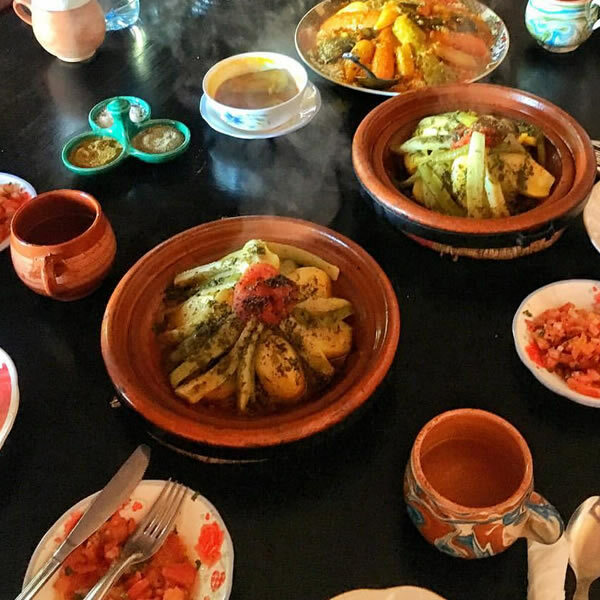 Dear visitor, you are making now a trip to one of Morocco's most captivating and authentic regions, the M'Goun Valley, better known as the Roses Valley. A labyrinth of splendid valleys and gorges join the M'Goun Wad, a timeless region where Berber culture has remained intact and where agriculture still plays a key role. 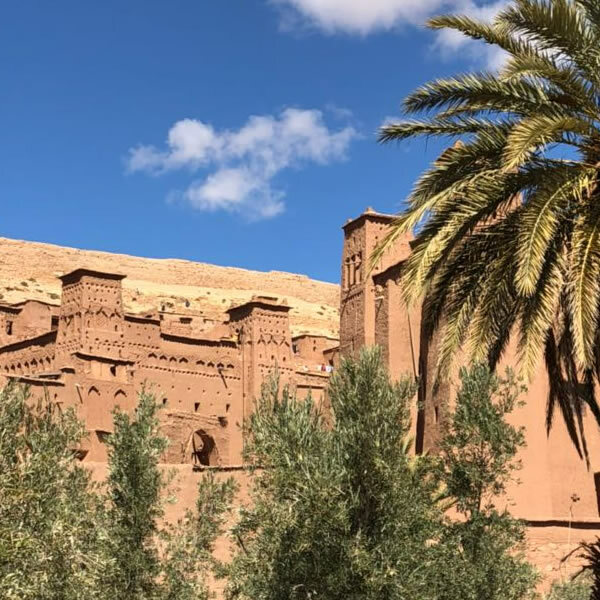 For everyone who is looking to discover the real deep Morocco, Dades Valley is a must visit and a real fun with groves of olive and fig trees, silent kasbah ruins from the past, Berber architecture and friendly people. Passing by the Monkey Fingers and drive then to Jbel Sahro to see high peaks and panoramic views and landscapes. Then we will drive in direction of Tizi'n'Tazazert, far away from any touristic area, isolated from the world and time, the mountain lodge Tizi n'Tazazert is located a few meters from a pass in the foothills of the High Atlas and on the edge of the desert, in a majestic setting. Then toward Nkob with its different Kasbahs and back to jbel sahro for staying there the night. Leaving Nkob for going to Tamnougalt, a lovely valley where kasbahs and date palm oasis are scattred all over the region,in the middle of Atlas Mountains and near the Draa River. Passing by Palmeries and Agdz village before reaching Ouarzazate, the capital of the South-East. We will visit the famous Ait Benhaddou where famous international films were turned like gladiator and Lawrence of Arabia. We will cross a myriad of Berber villages and beautiful kasbahs, then we will drive through the pass of Tizi'n'Tichka before arriving to Marrakech.